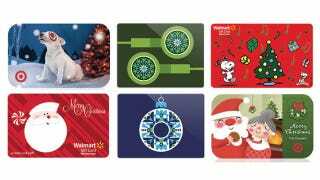 Gift cards are the laziest, lousiest, most convenient, popular and widely given present. And this is your yearly reminder of just how much they stink. Since 2005, we've tossed out more value in gift cards than the entire GNP of Ghana. $41 billion is pretty hard to defend. We're lazy; we have things to do; we... didn't really want the damn things in the first place. Things have gotten a little better over the past few years, since the Card Accountability, Responsibility, and Disclosure (CARD) Act passed in 2009, but in 2011 there are already $2 billion in unused cards. That's down from $8 billion in 2007, but still, $2 billion a massive amount of waste.